The primary difference between practicing to simply “perform” skills and practicing to actually “apply” them is involving the processing of information. …and focus techniques to make their tasks easier and to more closely resemble their practice even in the middle of a potentially stressful moment during a big game or important event. The advantage that these athletes have over a defensive shooter, of course, is that they are just playing a game… and they have full awareness ahead of time as well as a great deal of control over the exact moment that they perform their skills. When you are responding to a lethal ambush, you have none of that… all you’ve got is whatever ability you possess to apply your skill under the circumstances you are faced with at the moment. Learning and practicing to use your gun in drills that force you to process information just before you shoot or even while you are shooting is the best way to develop your ability to apply your defensive shooting skills. In a real fight, you don’t get a warning, a warm-up or much time to process what it is you need to do. Position yourself 12-15’ from a target stand with 3 shapes: an 8×10” rectangle and two 3” circles. The circles should be different colors and just above rectangle, one on the right, one on the left. Have your training partner call out commands such as “Threat!” or “Left!” or “Right!”. On any command that indicates the rectangle as your target, you should fire 3-5 shots as quickly as you can while keeping the shots in the box. On any command indicating one of the circles, you should fire a single shot into the circle. These two activities should require different balances of speed & precision. Most people should be firing shots without visual reference to their sights, while they should be closing an eye and using traditional sighted fire for the circles. You can increase the complexity of this drill and the need to think by making the circles different colors and/or making one of the circles a different shape of the same size. These create options for your training partner to use more varied commands in addition to the directional ones. Place multiple photo-realistic targets at plausible distances in front of your shooting position. The targets should all be wearing different clothing, carrying different weapons and feature different types of people. Have your training partner call out short descriptions of some aspect of the intended target as your command to fire. Examples might be “Shotgun!”, “Blonde Woman!” or “Blue Hat”. Engage each target with a 3-5 shot string of fire into the high rectangle. 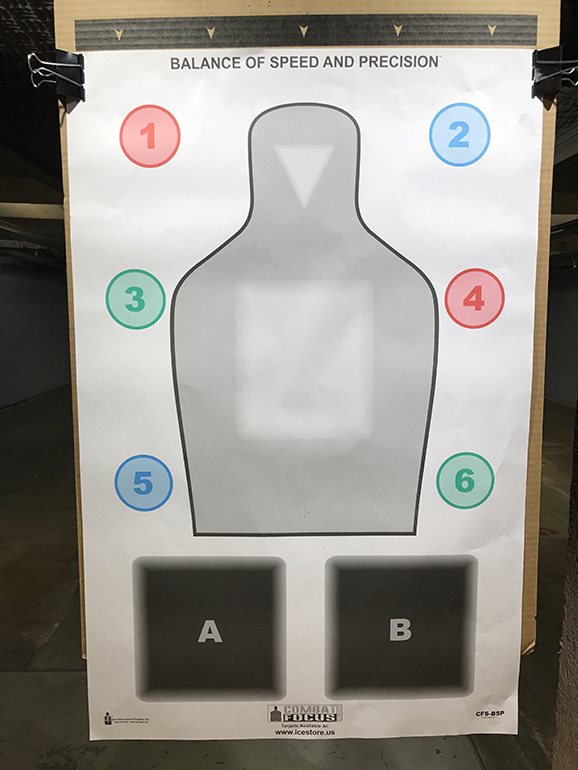 Your training partner might occasionally call out “headshot” (for the circle target) immediately after the descriptive command to vary your shooting response. Place several numbered targets, 1 through X, at reasonable distances from your shooting position, where X is equal to the number of targets you have placed. For best results, use at least 5 targets. Have your training partner call out a number that any two target numbers can be added together to make. You should shoot both targets (3-5x if chest sized, 1x if headshot sized) with an assessment phase between them. To add complexity, you can be sure to shoot a different number of rounds at each target when engaging chests. To add more complexity, your training partner can create other math problems, explaining the formula to you and then calling out the number that allows you to solve the problem and then shoot.